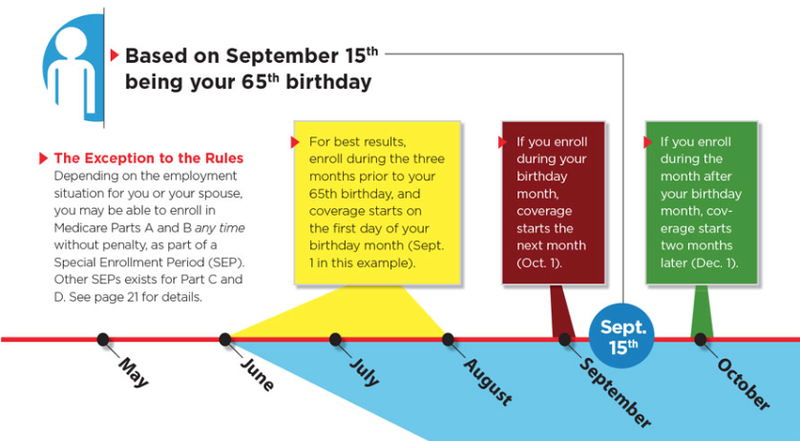 Failing to enroll in basic Medicare (parts A and B) three months before or during the month of one’s 65th birthday creates at least a two-month delay in coverage. People can buy or switch their Medicare Advantage and Part D drug plan between Oct. 15 and Dec. 7. But Advantage plan disenrollment dates are Jan. 1 – Feb. 14, when simultaneous Part D enrollment is also permitted. To avoid underwriting rules that may restrict coverage or increase premiums for private Medigap coverage, enroll in Medigap during the six-month period that starts the month of one’s 65th birthday. This is article is not entirely competent. Medicare Part A is what one MUST enroll in at age 65. If one is still working with at age 65, as one needs to these days to reach the Social Security “full retirement age,” then you may have medical insurance through your employment or your spouse’s employment and you may have no need to enroll in Medicare Parts B, C, or D. But you still need to enroll in Part A at age 65. Don’t worry, Medicare Part A is free if you enroll at age 65. I’m agreeing with Rick on this, it isn’t clearly stated that Medicare A is the coverage you must sign up for during the time frame in the article. Accurate information to prepare for Medicare is available “free of charge” at the http://www.medicare.gov website. But! But! But! I have more and more folks who are working past age 65 and we have learned together that enrolling in Part A shouldn’t be automatic. I have a client who is still working and eligible for employer provided health insurance for her and her spouse. This is a high deductible policy with a HSA into which her employer makes significant annual contributions. If she signs up for the free Part A, she will no longer be eligible to contribute or receive her employer contributions into the HSA. That would have been an expensive mistake.